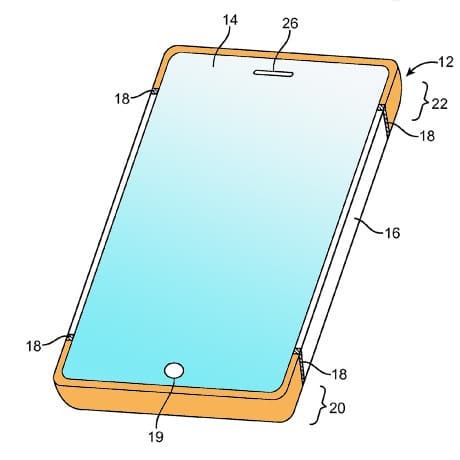 Apple has applied for a patent on an antenna design that allows NFC signals to be transmitted from both the top and bottom of a mobile phone — front and rear — reducing the need for a user to orientate their device in a particular way when conducting an NFC transaction. The patent application also describes methods for sharing antenna elements between a device’s different radios, and in particular how to share these components between near- and far-field transceivers. US patent application number 20140139380 — Shared Antenna Structures for Near-Field Communications and Non-Near-Field Communications Circuitry — was filed in November 2012 and published by the USPTO last week. The wireless communications circuitry may include radio-frequency transceiver circuitry and antenna structures. The radio-frequency transceiver circuitry may include near field communications circuitry that operates in a near field communications band. The radio-frequency transceiver circuitry may also include non-near-field-communications circuitry (far field communications circuitry) such as such as cellular telephone, satellite navigation system, or wireless local area network transceiver circuitry. The non-near-field communications circuitry may operate in one or more non-near-field communications bands. The antenna structures may include conductive housing structures such as a peripheral conductive housing member. The antenna structures may be based on an inverted-F antenna resonating element or may have other types of antenna resonating element. The antenna structures may be configured to handle signals associated with the non-near-field communications circuitry such as cellular telephone signals, satellite navigation system signals, or wireless local area network signals. The antenna structures may also be used to form a near field communications loop antenna. The near field communications loop antenna may handle signals associated with the near field communications circuitry. Sharing the antenna structures between near field and non-near-field applications allows device size to be minimized. “Antenna structures may be formed at opposing ends of an electronic device,” the patent application adds. “Combining circuitry may allow the near field communications circuitry and the non-near-field communications circuitry to be coupled to common antenna structures. Is this an epiphany of The Hare and The Rabbit? Apple has taken a back seat with NFC all this time, but have looked at the teething problems and if and when they do roll it out, Apple will Nail the deployment of NFC. Apple has invented nfc! Hooray! Nice to see their lawyers are working on something. Wish they would concentrate on leadership through innovation AND implementation, instead of focusing on cowardly lawsuits and obstruction. IMO, it’s OK to hate both. No harm, once you start down the hate path to just keep on going. At least you can be consistent. So I guess this means Android devices will always have NFC antenna on the backside only…? I was hoping Google would allow it all around in the future, but it looks like they’re stopped by the lawmakers!